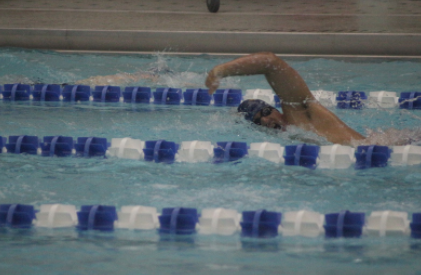 Kevin Ochoa competing in the pool. Photo from Blue and Gold archives. A swimmer since age six, Kevin Ochoa has steadily improved and maintained his commitment to the sport but the senior, described by Athletic Director Charlie Conefrey as humble and “a silent leader,” never imagined he would become a member of a coveted and exclusive league of swimmers. Ochoa now joins the ranks of Elia Fish and Julie Dempster as the third state champion for swim in all of Malden High School history. The success of the MHS swim team has experienced in recent seasons has been unprecedented and “extremely rare at the public school level,” says Conefrey, who has “never had to worry too much about the swim program.” Even in the midst of other competent and powerful swimmers, Ochoa showed particular promise to Conefrey since his junior year, when Conefrey began observing the team more closely when his role expanded from physical education teacher to the district’s athletic director. Ochoa partially attributes his progression as an athlete and his victory as state champ to the confidence of his greatest motivators, including Confrey. “Seeing the reactions of [his] family, coaches and teammates really made all [his] hard work worthwhile,” Ochoa says. “Representing [his] school has always been something [he has] wanted to do,” Ochoa states, but he measures his success based on his “level of impact on the team,” not the accolades he obtains. Ochoa believes he will “be a Golden Tornado forever” and wishes the best to his team in its upcoming seasons, during which underclassmen will continue to carry his legacy. In spite of the loss the team will suffer from the departure of many talented seniors, including captains Ochoa, Sebastian Romani, Agatha Silva, Joanne Ho and Olivia Forestier, Conefrey remains unwavering in his confidence in the MHS swim team. He sees the potential to progress as far as Ochoa has in a handful of underclassmen, among them freshmen Chloe Akombi and Tony Giech, as well as sophomore David Lombardi. Lombardi hopes that after the departure of his senior captains the team is able to “rebuild to the point that [they are] competitive while also establishing a family atmosphere that is very similar to the one [they] have had.” With the arrival of new athletic talent, he is optimistic about seasons to come and his own potential as well as the potential of his fellow teammates.